Hitler's Stuka Squadrons is a book that separates fact from fantasy regarding the achievements and military career of the Ju 87 aircraft. Able to deliver its bombs accurately onto a target, the Stuka wreaked havoc in Poland and France against ground targets and refugee columns. Hitler's Stuka Squadrons charts the Ju 87's career in 1939-40, when German aerial superiority ensured aircraft losses were low. However, against Spitfires and Hurricanes in the Battle of Britain in 1940 the Stuka was shot out of the skies. The campaign in Russia saw the re-establishment of the Ju 87's supremacy, and would lead to a change in role to one of tank-busting. 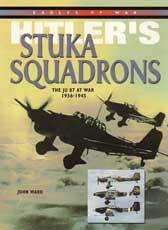 Hitler's Stuka Squadrons also covers the individual Stuka squadrons, their campaigns, tactics, and pilots. 224 pages, 10.3 x 7.7 x 0.7 inches, SB.